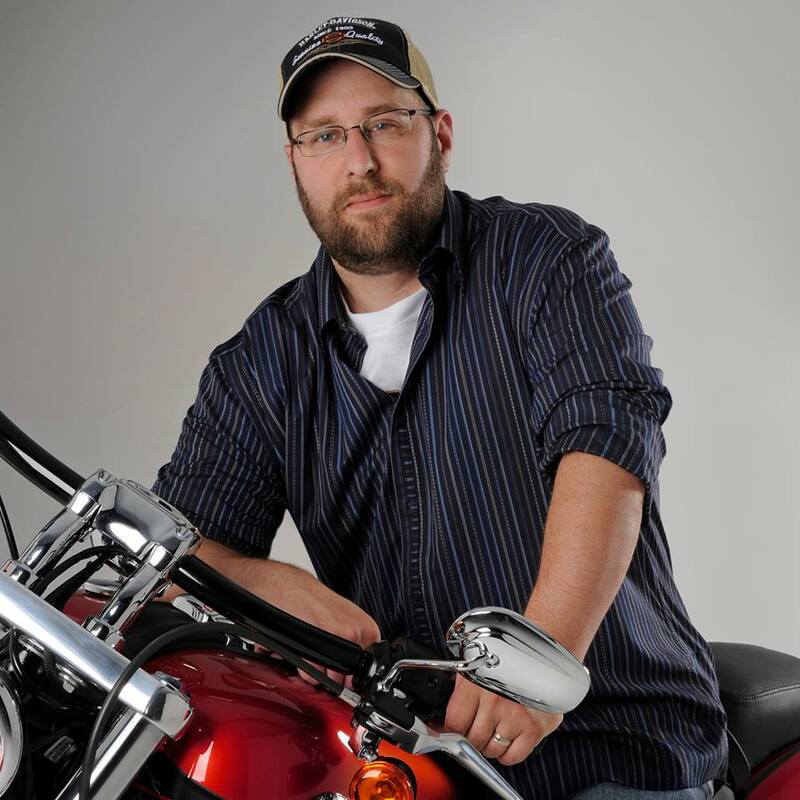 Mathew Hintz, the Official Artist of Daytona Bike Week, passed away unexpectedly at the age of 41 on December 24th 2017, leaving a wife and four children ages 6 – 13. His 2018 Daytona Bike Week painting was the last piece of artwork he completed before his death. Specializing in “gas and oil” subjects and the drama of professional sports, Hintz worked professionally for more than 20 years to develop the techniques behind his distinctive sculptural layered-paint portraits and rugged charcoal drawings. He captured the passion of his clients through impressionistic painting. Hintz created more than 60 paintings and gritty charcoal drawings, many of which were larger scale at 40″ x 60″. Hintz worked as a contract artist to the Harley-Davidson Styling and Creative Services Departments, working closely with Willie G. Davidson and others to create motorcycle paint designs, helmet graphics, and tank medallions. In addition to Harley-Davidson images, Hintz worked with Ford Images and also created sports art for Steiner Sports, painting athletes like Derek Jeter, Ryan Braun and Mike Tyson. If you attended Daytona Bike Week from 2015 to 2018, you may be wearing the artwork of Mathew Hintz on a patch or T-shirt right now. Hintz’ artwork was featured on the Official Daytona Bike Week poster for the Daytona Chamber of Commerce from 2015 to 2018. Hintz’ artwork was also on the cover of the official Daytona Bike Week guide for 2017 & 2018. If you bought a Harley-Davidson in the past decade, you probably have his work in your garage. Hintz created the original cover art for Harley-Davidson Owner Manuals from 2008 to 2017. One of Hintzʼs first assignments at Harley was to design the tank medallion for the Softail Deluxe motorcycle. If you have been involved with the Harley Owners Group (HOG), you’ve worn his artwork. Hintz designed rocker patches, t-shirts, logos and graphics for HOG, Buell, and Harley-Davidson MotorClothes, as well as anniversary merchandise and models. Hintz was passionate about leveraging the power of his art for good works. As a father of four, he was focused on assisting children in need. His artwork was auctioned to support the Muscular Dystrophy Association (MDA) through Harley-Davidson, the Make-A-Wish Foundation and Curing Kids Cancer through Mecum Auctions Company. Hintz co-created two paintings with Reagan Imhoff, now the MDA National Ambassador. Reagan’s mother Jenny spoke at his funeral, sharing how the two families bonded and spent time together over the past few years. During one visit, Hintz’s youngest child helped Reagan build a fairy garden in the back yard. Jenny said that when they heard the news about Matt’s passing, Reagan’s first thought was about his kids, because she knows how much he loved and adored his family. She wanted to make sure they were taken care of. You are kind, funny, creative, generous and have the biggest heart! I will miss you so much and I will never forget all of the fun we have had together making messes and creating so many cool pieces of art. Thank you for all you have taught me and thanks for sharing you love of art. I will miss you so much. Rest in peace, Mathew Hintz. Keep the angels up there on their toes – and help them paint beautiful skies for all to enjoy.